I went on a baking spree last weekend because two of my favorite bloggers, Alice of Savory Sweet Life and Ashley of Not Without Salt, started talking smack on Twitter about who had the best chocolate chip cookies. Since they both live in Seattle, there was no way I was going to be able to try their cookies and make up my own mind unless I made them myself. Lorna Yee from The Cookbook Chronicles also threw her hat into the ring, but she hasn’t posted her recipe yet, so I haven’t had the chance to make them. But Lorna did show off her cookies last week, as well as provide a thorough breakdown of Alice and Ashley’s recipes. 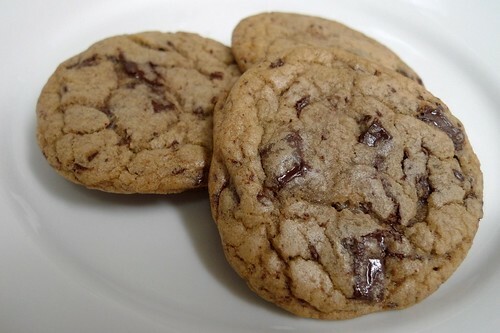 Inspired by Lorna’s analysis, I decided to compare their recipes to my favorite recipe, Thomas Keller’s Ad Hoc Chocolate Chip Cookies (courtesy of Food Gal Carolyn Jung), and the Original Nestle Toll House recipe. With a few exceptions, the ingredients and techniques are basically the same, so it’s interesting to see how the proportions vary from cookie to cookie. Ashley’s cookies could easily be called “pound cookies” since they contain a pound of flour, a pound of sugar and a pound of chocolate. They’re crispy on the bottom and dense and chewy in the middle and reminded me of the Ad Hoc cookies. 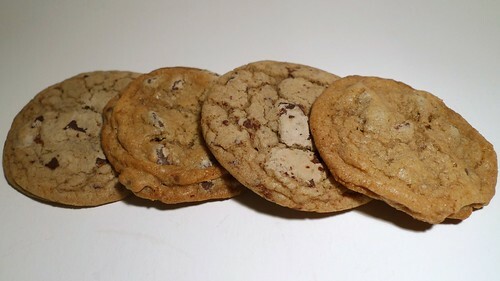 Her use of chopped chocolate instead of chips allows the chocolate to pool inside the cookie so that you get huge bursts of chocolate in every bite. 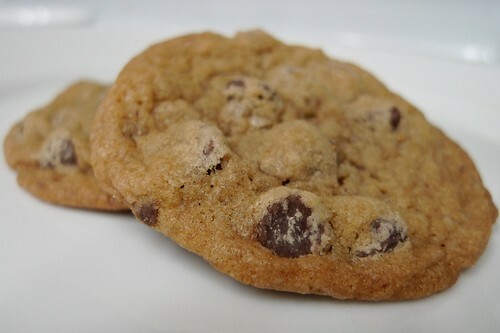 As Ashley says in her “last chocolate chip cookie” post, the dough is really only there “to hold the chunks of chocolate in place.” The addition of turbinado sugar gives the cookies a nice crunch and texture, as well. I didn’t have 16 oz. of chocolate to make the cookies since I had sort of eaten away at the Scharffen Berger stash I got at BlogHer Food 09, but 12 oz. was still plenty of chocolate. I was a little worried when I made Alice’s cookie because the dough was much lighter and airier than Ashley’s, and it showed in the final product. I couldn’t find my usual Guittard chips at Whole Foods, but Ghirardelli’s semi-sweet chocolate chips were a nice substitute. The cookies came out thin and fluffy with crispy bottoms and reminded me of the classic Toll House recipe. When paired with milk from Straus Dairy, possibly the best-tasting milk I’ve ever had, I was transported straight back to elementary school. I absolutely love the chart. It’s great to see how much they vary – and yet they’re all just so darn tasty. If you ever need a second opinion, you know, I’m your girl. I love this write up!!! Thanks for all your hard cookie testing! I usually do Tollhouse, only I substitute 4 oz of shortening for 4 oz of the butter and add some flour (makes it less thin/lacy), and also I like to throw in at least half a bag of Heath bar toffee bits in addition to the chocolate. Of course now my wife constantly gets requests for the cookies during the holidays…lol. Julie: If you can fend of my wife as tester… haha! 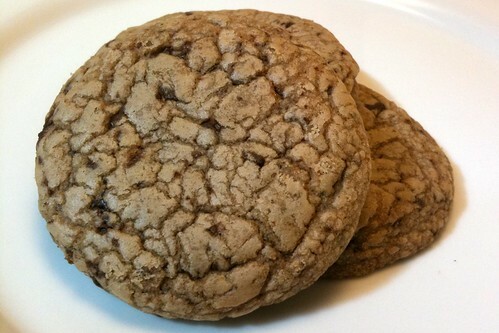 Fuji Mama and Susannah: Isn’t it cool how all these different proportions and styles can produce delicious cookies? Suddenly, I have a craving for chocolate chip cookies. The question is, which one? I always make Alton Brown’s chewy recipe. I love the comparison chart. Ashley’s cookies look great, I really like a thick soft cookie. I’ll have to give her recipe a try. I hope Steph has seen it; she would absolutely love the scientific breakdown! Dropping by the let you know that last week I got crazy enough to try ALL of the recipes above. I liked Alice’s the best, though I thought all of them were excellent. It was fun! Now you’ve got me wanting a chocolate chip cookie, hehe..great post and very informative about the different types of cookies and recipes; thank you for this info. I’m looking forward to meeting you at the Foodbuzz Festival in San Fran on Friday! I have never seen the chocolate chip cookie analyzed this way, and I had a little light-bulb-over-the-head moment in realizing this could be a very useful tool for me to improve my sad baking skills. I’m a prolific cook, but baking is inexplicable a hit-or-miss (mostly “miss”) affair for me. Probably because I tend to deviate too much from the recipes: that’s where your helpful chart will come in handy!